Let's Get to the Meat of the Matter! We at KosherEye have received numerous questions from our readers about poultry and meat; how to buy it, prepare it, freeze it, serve it and more. Now KosherEye is delighted to have its own resident expert ? none other than author, chef extraordinaire and cooking instructor, The Kosher Carnivore, June Hersh. Bring those questions on! June will answer them in her new monthly column on Koshereye.com, Ask The Kosher Carnivore. 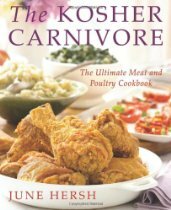 And each month, she has generously offered to give away one of her books, The Kosher Carnivore: The Ultimate Meat and Poultry Cookbook, to the reader who submits her favorite question. Submit your questions to: ContactUs. It's officially spring! The temperatures in the northeast are slowly climbing, the days are decidedly longer and the chill in the air speaks of daffodils not impending snow. For me, one of the perks of spring is spending more time outdoors, strolling through the small neighborhoods that define New York City and finding the perfect place for Sunday brunch or exploring a rural sleepy town and discovering its hidden gem of a diner. Maybe because I am not a spring out of bed kinda girl, breakfast interests me little- but brunch is another thing. Give me a restaurant cooked dish that brings the best of both breakfast and lunch together- backed by a killer Bloody Mary and I am a very happy camper. What I love about brunch is it gives you an excuse to eat meat for breakfast. I'm not talking about a timid slice of turkey bacon or a link of chicken sausage. I'm talking full on meat for breakfast that requires two napkins and a serrated knife. Should you not share my sense of venturing out for brunch goodies, here are three of my favorite restaurant quality dishes that will kick your mid morning meal up a notch. Even better- have someone else serve it to you in bed- spiked V-8 optional. 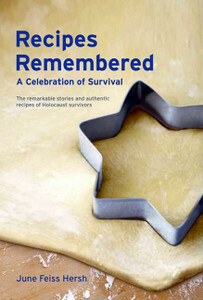 When I think of Passover I think of the valiant and resilient survivors I interviewed for my first book, Recipes Remembered. I think of Joan Ferencz who spent the final months of the war in Auschwitz. I listened in awe as she told me how she grasped her sister's hand and pulled her to the line that survived. She recalled Passover in her home before those dark days where she would run up to the attic to collect the Pesach plates. It was a memory that brought joy to her gentle face. I hear Ida Frankfurter as she told me a story of her liberation from the Peterswaldau camp in Ober Silesia. It was a camp where she worked in the munitions factory having been transferred from Auschwitz and from which she took a souvenir of an empty grenade shell. That shell now stands as a centerpiece on her Passover table to remind her that she too was once a slave. When I think of Passover I remember the day I sat in the Upper West Side office of restaurateur George Lang. He escaped Hungary in the back of a hearse and became a premier figure in the culinary world. 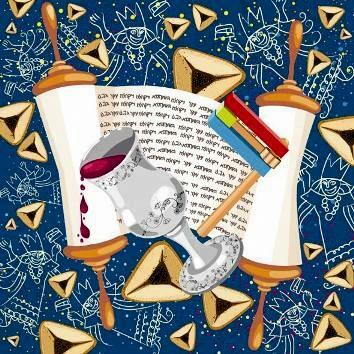 His accomplishments were legendary as is the recipe he gave me for a Passover dish that was dear to his heart. I recall Freda Lederer's shy and reserved voice telling me how she was transferred to Bergen-Belsen from where she was liberated by the British in April of 1945. She is so proud that she still prepares both Passover Seders at her home in Harrisburg, PA where her entire extended family enjoys her Hungarian cooking. So, for my monthly column that usually touts the merits of too much meat, I am going in a different direction. No fears, I am not suggesting a vegetarian menu. However, I am going to share with you recipes from "my" Hungarian survivors who shared their stories of hope and faith and their cherished recipes with me. Recipes where Passover was a cornerstone and the concept of freedom and exile had heightened meaning and tremendous importance. If you have a copy of Recipes Remembered, I urge you to read these stories at your Passover table and make them part of your holiday tradition. If you do not, then I hope you will visit Amazon.com or the Museum of Jewish Heritage and claim a copy for yourself. The recipes will inspire you to cook and the stories will inspire you to live your life to the fullest. The proceeds from all sales go to benefit The Museum of Jewish Heritage, so this Passover when you buy a book, you will be performing a miracle. It might not be as flashy as a burning bush or as monumental as parting the Red Sea, But you will be living my mantra to Eat Well-Do Good. Congratualtions to Debbie Frankel – February winner of a $50 Gift Certificate for Jack's Gourmet Kosher products. There's a simple parable that I retold in my fist book Recipes Remembered, a Celebration of Survival. I find it so true and illustrative of what I love most about my favorite winter–time comfort food – Soup. In a small shtetl in Poland, the people were struggling and food was scarce. A soldier marched into the tiny village, hungry and tired and asked for something to eat. The townspeople told him of their plight and he re-assured them that he could make a delicious soup from a stone. He dropped a stone into a pot of boiling water, and a crowd began to gather. They were skeptical, but the soldier assured them of a rich broth; so they waited with great anticipation to taste the soup. He encouraged the villagers to contribute small offerings from their gardens and farms. Soon the villagers began tossing in bits of cabbage, carrots, mushrooms, onions and potatoes. Some threw in pieces of beef, turkey and chicken as the soldier encouraged them and told them how delicious the soup would taste. By the time the entire village gathered to watch, the pot was filled with every vegetable grown in that small town and every cut of meat the butcher could find. Hand rolled dumplings and homemade noodles filled the pot and the aroma was splendid. The finished soup had an intense color and flavor and the villagers and the soldiers enjoyed a wonderful meal. While the moral of this tale might be that when people come together they can create magic, it is also a culinary lesson in soup 101. To make a great soup you need a big pot, fresh ingredients and time. Whether you start with a beef, chicken or vegetarian base (that's right, the Kosher Carnivore used the V-word), soup is an amalgamation of wonderful ingredients coming together to create something hearty and satisfying. Pair it with a salad and crusty bread and you have comfort in a bowl. Here are a few of my soup how–to tips and favorite recipes. I hope they feed your body and soul on those inevitable cold winter nights; fire in the fireplace and furry slippers, optional. 1. Don't overlook H20. Good cold water is the basis for just about any soup. Whether you are whipping up a chicken or beef stock, simmering lentils or boiling barley, cold water and just about any vegetable or protein can create soup. 2. 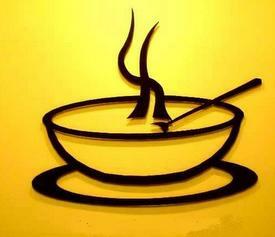 Just as your bones provide the structure for your body, they also provide the structure for soup. The gelatin in the bones gives soup added texture and flavor, they enrich the stock and embolden the taste. When breaking down a chicken or finishing off a roast, save those bones to add to your next batch of soup. 3. If they grow in the garden together, they will play nicely in your stockpot. Don't be afraid to pair different aromatics, cabbage and fennel, carrots and salsify, celeriac and potatoes go as well as peanut butter and jelly when tossed into a stock pot. Buy those veggies that are seasonal and local, your soup will thank you. 4. Nothing in your kitchen should boil except water, so when preparing soup, turn the heat up just to bring everything to a boil and then reduce the temp to simmer. Simmering slowly coaxes the flavors to meld, while boiling hits them over the head. 5. When it comes to stockpots, size does matter. You want the height and diameter to be equal to mitigate evaporation when slow cooking. And that lid that comes with the stockpot, don't always assume it's better to trap the heat. When making stock (see the complete section in The Kosher Carnivore for preparing stock) it's necessary to leave the lid off so that water slowly escapes from your pot and concentrates the stock's flavor. 6. Choosing the right meat for soup is as easy as a first date. Go cheap. Chicken wings and backs work great in a chicken stock, shin bones and oxtails are delicious for a rich beefy taste and turkey giblets and frames are wonderful to add depth of flavor. Save your fancy cuts for the main course, soup is all about keeping it simple. 7. Consider condiments. Finishing a bowl of soup before serving with a pinch of sea salt, a drizzle of extra virgin olive oil or aged balsamic, or a sprinkling of fresh herbs is perfect. Some flavors cook out when added too early, but a finishing touch lingers on the tongue and enhances the soup. Here are three recipes with different origins and flavor profiles. When making soup, the recipe is the basis, but your cupboard and fridge are your inspiration. Toss it in and see where the ingredients lead you – I promise it will be delicious. 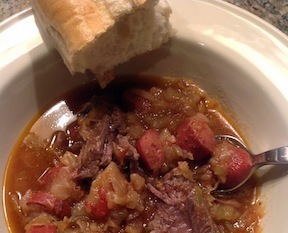 Grandma Rose’s Schi – Russian Cabbage Soup: There are dishes that transport all of us back in time. Maybe an aroma that fires up a memory or a taste so singular that you know exactly the time and place you first experienced it. For me, one of those immutable memories is cabbage soup. Gruenkern Soup with Mini Turkey Meatballs: When working on Recipes Remembered "my" survivors talked about a very popular German ingredient called gruenkern.It was a staple in their cooking and I wanted to incorporate it into a dish. Beef and Barley Soup: This iconic American dish walks a fine line between a soup and a stew. Thick and rich, laden with beef bits, chewy mushrooms and tender pearl barley this soup is a meal in itself. Let’s talk turkey…. Just kidding, let’s talk anything but turkey. By now you are overwhelmed by turkey day leftovers, which find their way into just about every dish this time of year. There’s turkey chili, turkey tacos, turkey tamales. I’m waiting for someone to develop a recipe for turkey pancakes. So, let’s get off the turkey trot and dance to another tune. I’m talking BBQ. I know its winter for most of us, there’s snow on the ground for some and few leaves left on the trees. That’s why I am suggesting we bring a bit of BBQ into the kitchen to brighten up these shorter days and longer nights. During the winter months we tend to stew and braise; and there’s nothing wrong with that. I love a great beef stew with chunks of beef chuck or slow braised lamb shanks whose fat melts into the sauce and the meat luxuriously falls off the bone. But it’s during these cold winter days ahead that a touch of summer can enliven our kitchen and our mood. No need to ignore some great cuts of meat that we generally grill or slather in BBQ sauce, just because the grill is covered and the basting brush is hibernating. Here are a couple of my favorite indoor BBQ dishes; feel free to slip on a pair of flip flops, pour a glass of lemonade and get your grill on. Brisket is everyone’s favorite holiday dish evoking memories of grandma, glazed carrots and Lipton onion soup. Well, I like to take brisket to another level and bring out its natural juiciness by bathing it in a spicy barbecue sauce. This is a perfect dish for a game day Sunday for a large crowd, as the brisket can be pulled apart and served up sloppy joe style on soft rolls. I’ve taken the shredded meat and used it to stuff dumplings, or tossed it with pasta for a barbecue brisket ragu. It starts off the night before with a gentle rub and then slow cooks all day long. It’s the perfect antidote to typical braised brisket without losing any of the wonderful texture and flavor that we look to brisket for. I’m a 2nd cut fan, in love with the fatty cap that helps lubricate the meat while it slowly cooks, but you can certainly buy first cut if lean is your thing. You sacrifice a little moistness, but it’s your call. Teriyaki Glazed Should Lamb Chops. Often overlooked because they look less pretty than rib lamb chops, these shoulder chops make a great presentation when grilled. Because they come from the shoulder they are less tender, and need to marinate, but are well suited to grilling or broiling. Save your expensive rib chops for fancy schmancy company and serve these indoor grilled teriyaki shoulder chops for a terrific weeknight meal. 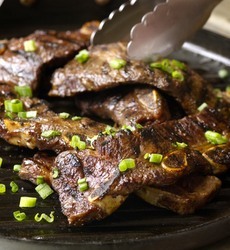 Korean Kalbi Ribs. Nothing says summer like ribs, whether you choose those mammoth ribs from the standing rib roast section of the animal, or meaty flanken (short ribs). Here’s a quick rib recipe, which brightens up a cold winter’s day. Bring a touch of Asian spice to the table with a cabbage slaw, or hot bowl of miso soup. If you have a ribbed grill pan or indoor grill, that’s great, if not, your broiler will do just fine. The trick to getting these just right is having your butcher cut the ribs very thin. You’ll want to choose flanken from the chuck and have them cut 1/2-1/4-inch thick. 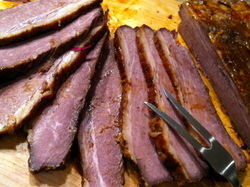 First Cut Brisket - Why is it Dry?